Why should I become a VIP player? 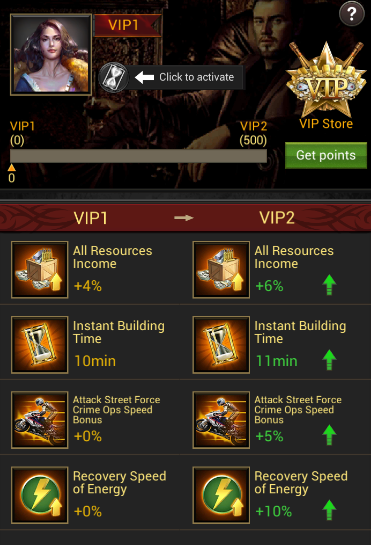 VIP players can experience a variety of benefits (like: Instant Building Time, All resource Income, Attack Street Force Crime Ops Speed Bonus, Recovery Speed of Energy,Crew Attack Bonus etc,which helps VIP players to develop faster and gain greater advantage during battle. As the VIP level increases the benefits gained becomes more and more obvious. With this we can presume that all VIP are outstanding! Click on the 【VIP】 button next to the Image and enter the VIP interface. There you can view all the unique benefits for each VIP level.